Tioga, ND — When North Dakota farmer Steve Jensen discovered crude oil saturating his wheat field in September 2013, he had no idea a pipeline break had belched nearly 1 million gallons of the hydrocarbon onto his precious land — or that, three years later, the company responsible would still be far from cleaning up the toxic mess. “What happened to us happened and we can’t go back,” said Patty Jensen, Steve’s wife, of one the largest onshore oil spills in U.S. history, which happened on their property. “But I get really upset when I hear of a new one and I wonder what is being done to prevent these spills,” she added, according to the Associated Press, of a recent spill that sent 176,000 gallons of crude from a Belle Fourche pipeline in Belfield into the Ash Coulee Creek, a tributary of the Little Missouri River. Oil is believed to have traveled as far as six miles downstream, sullying an untold expanse of private and U.S. Forest Service land — and likely compromising sensitive ecosystems. Both spills, the Belle Fourche and the Tesoro Corporation — the one still poisoning the Jensens’ wheat field — occurred less than 200 miles from camps supporting the Standing Rock Sioux Tribe’s opposition to the Dakota Access Pipeline are set up near the Missouri River’s Lake Oahe reservoir. Despite various criticisms of opposition to Dakota Access, the two crude spills — both from 6-inch steel lines — evince precisely why pipeline opponents cite the oil and gas industry’s astonishingly poor safety record in calls to end all construction of new oil infrastructure. And the Tesoro break occurred on land, away from any waterways and some distance from the nearest residences — Dakota Access is slated to run underneath Lake Oahe — the sole drinking water supply for the Standing Rock Reservation and, downstream, the source of water for some 18 million people. Incidentally, the Tesoro pipeline runs underneath the Jensens’ property. Energy Transfer Partners, which is constructing Dakota Access, insists their pipeline is safe and fears about water being contaminated with toxic crude are unfounded — but its own horrendous pipeline safety record says otherwise. 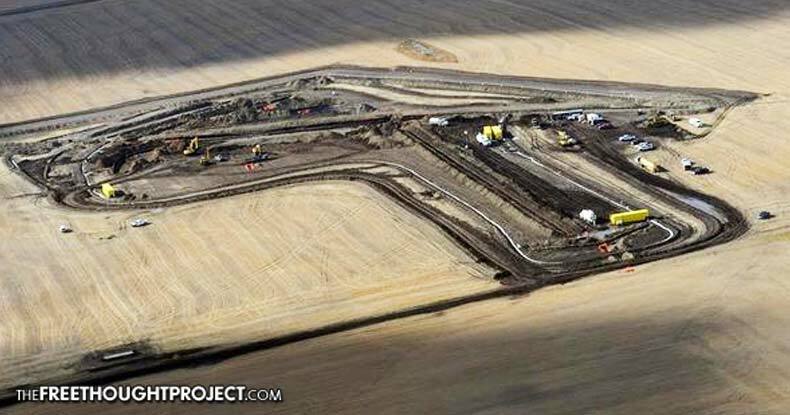 Tesoro estimates cleanup expenses to soar to $60 million — and, as North Dakota Department of Health environmental scientist Bill Suess told the AP, has had to dig 50 feet in some areas of the field to remove hundreds of thousands of tons of crude-contaminated soil. Initially thought to comprise 750 barrels — just under 31,500 gallons — the total spill volume had to be subsequently and exponentially updated to 20,000 barrels. Also, original reporting claimed the crude spill covered seven acres, an area the size of seven football fields — but that proved incorrect by nearly half — and was updated to 13 acres, or 13 football fields. Tesoro crews admitted despite work around the clock since the spill was first discovered, Suess said, less than a third of the total amount has been recovered — or ever will be. Tesoro spokeswoman Destin Singleton would not confirm spill figures for the AP, but did note a cleanup completion date has not yet been set. Evidencing another primary concern of Dakota Access opposition, the Tesoro and Belle Fourche pipelines are both remotely monitored — but equipment failed to detect either leak. Both were discovered by property owners. ETP has heralded remote monitoring as a failsafe to detect and shut down any leaks along the Dakota Access Pipeline. History recent and distant shows pipeline companies inept at handling pipeline breaks and spills of every size and volume. Original reporting on the wheat field spill — compared to information three years hence — shows how Tesoro’s response completely missed the mark in the initial stages. At the time, Tesoro estimated cleanup would cost just $4 million. What the Jensens are still experiencing three years and three months in is precisely why thousands of people have camped at Standing Rock — and now other locations around the United States where pipelines are planned in spite of vociferous objections from local residents.